At ConfiDenT, we pursue excellence in implant dentistry. Our dentists are highly trained in this restorative dentistry field. We consider it a privilege to help patients regain a confident and beautiful smile after missing teeth. Dental implants can be used in a variety of ways, from replacing a single missing tooth to supporting a full denture. While all dental implants have a post that is surgically placed into the jaw, the implant restoration that is placed on top may differ based on your specific clinical needs. Implant restorations are the part of the dental implant that makes up your prosthetic tooth or teeth. This is the component that is visible to others, so it is important that it looks and feels natural. 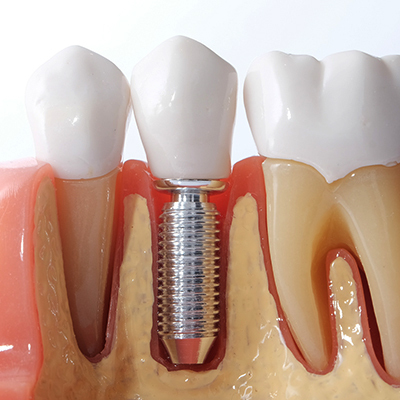 Once the dental implant has successfully healed, an implant restoration can be placed on top. At ConfiDenT, we proudly offer custom dental implant restorations such as crowns, bridges and dentures. Regardless of which option you choose, you can trust that your implant restoration will be crafted to provide a beautiful and natural-looking appearance as well as long-lasting function and durability. If your crown, denture or other implant restoration needs maintenance or repairs along the way, we are here to handle that too. Dental implants carry a remarkable success rate of over 98%. With proper care, your dental implants can last a lifetime. However, this doesn’t mean that dental implants are exempt from failure or damage. In most cases, it is the implant restoration (crown, bridge, etc.) instead of the implant itself that may require repairs. Whether you just received dental implants or you’ve had them for several years, if you experience a change in the way your implant looks, feels or functions, we want to know about it. 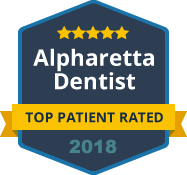 At ConfiDenT, we are equipped to perform all types of implant repairs in the comfort of our modern Alpharetta office. To learn more about our options in implant restorations or to schedule your implant repairs, please contact us today. We are proud of our ability to provide full service care in implant dentistry, from your initial consultation and implant surgery to placing your restorations and handling your implant repairs. You can expect superior, patient-centered care at every step.